Small breed puppies, adult dogs not prone to gaining excess weight. Pregnant or nursing dogs. 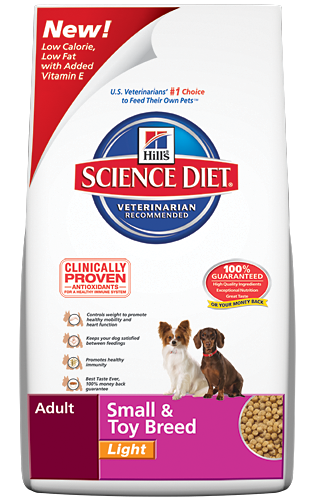 During pregnancy or nursing, dogs should be switched to Science Diet® Puppy Small & Toy Breed dog food. Whole Grain Corn, Soybean Mill Run, Chicken By-Product Meal, Powdered Cellulose, Corn Gluten Meal, Soybean Meal, Chicken Liver Flavor, Soybean Oil, Lactic Acid, vitamins (L-Ascorbyl-2-Polyphosphate (source of vitamin C), Vitamin E Supplement, Niacin, Thiamine Mononitrate, Vitamin A Supplement, Calcium Pantothenate, Biotin, Vitamin B12 Supplement, Pyridoxine Hydrochloride, Riboflavin, Folic Acid, Vitamin D3 Supplement), Iodized Salt, Potassium Chloride, Flaxseed, Vitamin E Supplement, Choline Chloride, Dicalcium Phosphate, L-Lysine, Taurine, minerals (Ferrous Sulfate, Zinc Oxide, Copper Sulfate, Manganous Oxide, Calcium Iodate, Sodium Selenite), L-Tryptophan, L-Carnitine, preserved with Mixed Tocopherols and Citric Acid, Beta-Carotene, Rosemary Extract.